Hospital Quality Metrics....Did You Know? 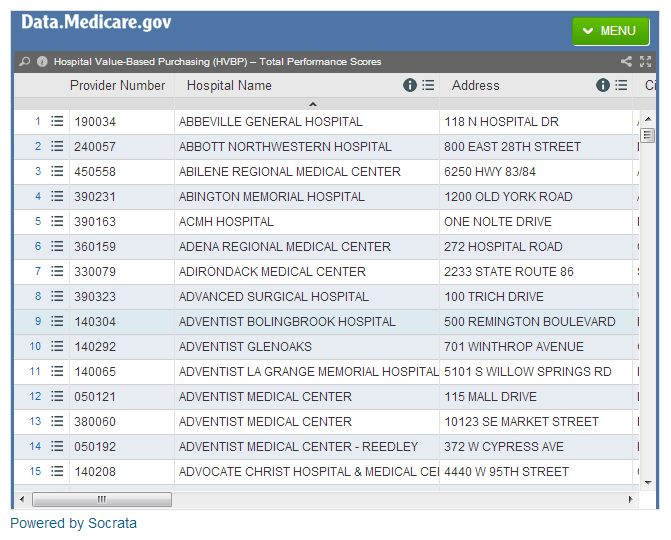 Did you know that Medicare releases hospital quality metrics for almost 3,000 facilities? I just learned this last week! 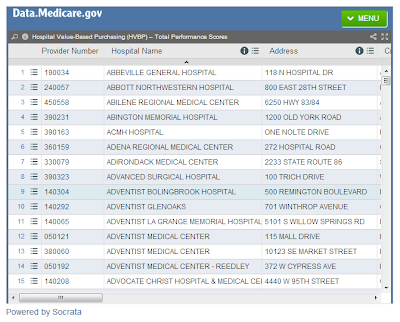 Through the Hospital Value-Based Purchasing Program, these scores are available for anyone to see right on the Medicare website. And the list can be sorted (for example, by alphabetical order of hospital name) or filtered (for example, to only show facilities in your state). 70% of the hospital score is based on clinical process of care measures (of which there are 12 measures) and 30% is based on patient experience of care measures. You can look at the scores separately for each measure by scrolling through a few menus, or you can look at the aggregate scores. It goes without saying that these measures provide a limited view of a hospital's total package, so you should really look at what they are specifically measuring before you put too much stock in the rankings, but I do find it pretty cool in concept. I hope that in future, hospital performance metrics will be even more transparent for individuals seeking care. How great would it be to have a single website displaying success rates for specific types of surgeries for many hospitals/surgeons at once (adjusted for level of difficulty, since certain hospitals may attract more challenging cases in the first place)? In the mean time, perhaps this Medicare website can be a starting point for opening the discussion about quality care. As it stands today, if you get an infection after a surgery and have to go back to the hospital, the hospital gets paid more for the additional services. In many ways, the future of health care is now moving in the direction of paying for quality, not quantity (paying more for an infection-free surgery, for example, instead of paying more for an infection-inducing one), but we need to be able to accurately measure quality first! There are a lot of problems that arise when trying to measure outcomes that are not entirely within the control of the physician; we definitely need innovative leaders to figure out which outcomes are actually worth measuring / reimbursing on the basis of "quality" or "success," and how to do so most equitably.